Time Label SHM-CD Reissue Series remastered by Bernie Grundman! A sonic marvel for audiophiles and invaluable treasure for jazz lovers and collectors! In this series of amazing SHM-CD reissue of Time label classic jazz recordings, reissue producer Akira Taguchi (of the XRCD fame) pulled all the stops. With one exception, all these titles are mixed and/or remastered from either the original 3-track recording tapes or the 2-channel master tapes by the legendary engineer Bernie Grundman, using a very special hybrid (tube and solid state) tape playback system. The digital master was then sent the JVC plant in Yokohama, Japan, to be pressed with finely tuned machinery controlled with a precise rubidium master clock, into the newly-developed SHM-CD with high quality polycarbonate material. The result is, by far, the best-sounding CD reissues of these recordings. One title (Hootenanny My Way by Terry Gibbs) had never been released on CD before, and four titles include previously unreleased alternate takes, thanks to the unprecedented access to the original tapes. 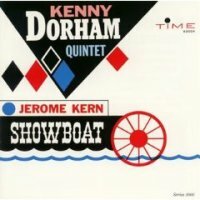 Showboat is a popular album by the perpetually underappreciated trumpeter Kenny Dorham featuring six Jerome Kern compositions from the famous broadway musical Showboat. His quiet demeaner and non-flashy style may have put him in a category of perpetually underappreciated musicians, but as you can hear in this album, his talent, taste and lyricism as trumpeter is undisputed. The other musicians -- what a cast! -- exhibit similar taste and support the leader impeccably. This is a thoroughly enjoyable, classic jazz album that is squarely in the middle of the mainstream jazz. Recorded on September 12 and 17, 1960 in NYC. Original recording produced by Bob Shad. This reissue produced by Akira Taguchi and mastered by Bernie Grundman. SHM-CD is compatible with all CD players.